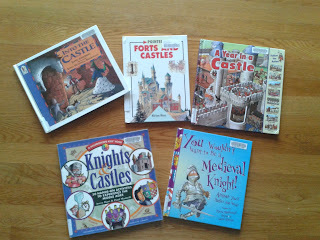 We love castles and knights! Mav was so excited to spend a week building with brothers' imaginext and playmobile sets. I mentioned we could make a Lego castle and I got this look, like.. umm Mom these toys are way cooler! I love including big brother in our week study. Here they are building and playing. Thanks to Poppins Book Nook for many of the ideas and links in this study! Their knights and castles link came at a perfect time! There was tons of great Castle ideas here. With it being Easter Week and having some other things come up I wasn't able to get to all that I had hoped. I wanted to be sure to book mark the link so we can come back to it later! 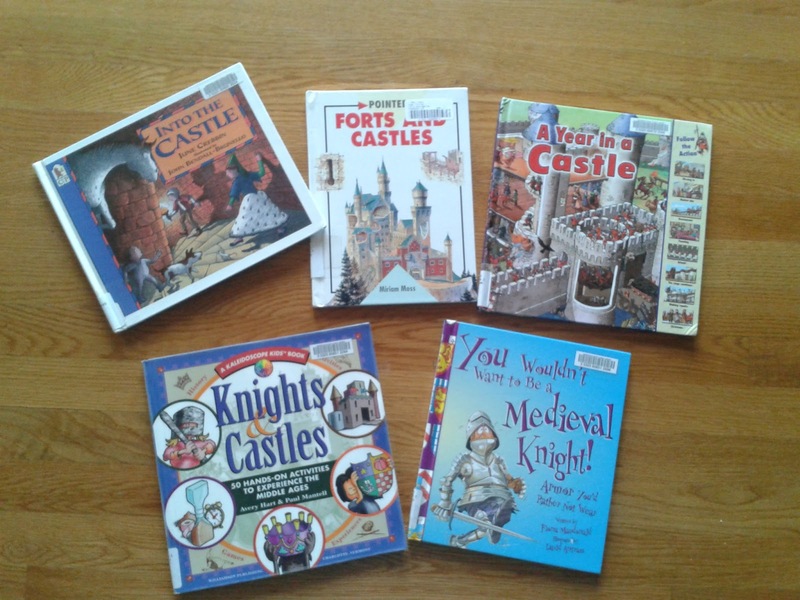 There are tons of books at the library, here are just a few we looked at! Castles are cool! I love the mystery of them. You know what they look like on the outside, but not always the inside.